The hotel restaurant was almost ready for service by we arrived promptly at 6:00 am, so we got a relatively leisurely breakfast and didn’t need to rush to catch the train to the convention center. Tanya, Joe, and the BC computer morning crew set to work out at registration with the new FencingTime (henceforth to be referred to as FT) check-in module, to make sure they were familiar with it and that it worked properly before they began training local volunteers on it. As I set up my own computer at the BC stage, a couple of A/V techs were just finishing setting up a speaker line for us, so we would be able to play the national anthem over the PA system. We’ve had an mp3 of the anthem on the tournament computers for years, but just holding the microphone to the computer’s speaker doesn’t work, so we’ve had to skip the anthem when there was no live singer. Inevitably, though, we never got to use the speaker line—the Portland local volunteers had arranged singers for every day of the tournament. 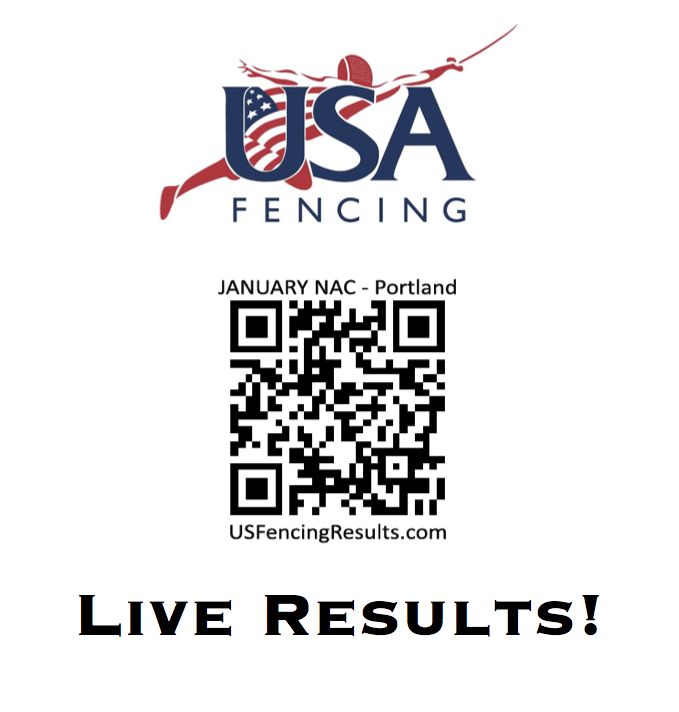 The folks out at registration discovered a small bug in FT— the first scan of the membership bar code brings up the fencer and a second scan checks the fencer in. Dan had apparently intended for the first scan to bring up the fencer name but had planned that the second step—checking the fencer in for that event—would be done with a mouse click on a screen checkbox. The double scan was far more convenient, so it was immediately reclassified as a feature. The big advantage to the FT check-in function is that it’s a live check-in on the network, so that the current information is accessible from the computers within the venue. Once we reach close of registration, we don’t have to wait for the printed list of no-shows to be brought in from registration—we can print it directly right there at the stage. Even better, any club changes or other corrections made out at registration go directly into the database, so that we don’t have to wait for them to be entered into the computer before we can start the event. Because of this new version of FT, though, we were all slower getting events started and running. The computer operators (even those who were familiar with earlier versions of FT) were working with unfamiliar screens, with a different order for setting event formats, and the printed pages looked different from what XSeed gave us. That’s one of the reasons January was picked for FT’s first full run—with only three events each day, any problems wouldn’t be likely to affect the overall schedule much, and we’d be able to adapt our work flow appropriately. One major difference between XSeed and FT is that in XSeed, you set up the event format for all rounds at the beginning. FT asks you at the beginning of each round what the format for that round will be, which is great if you want the flexibility to suddenly opt for a second pool round or repechage or fencing out 16 to all places. For us, that’s an unnecessary opportunity for operator error—in a tournament like January’s, where the Division I events have a 75% promotion rate from the pools instead of the more common 80%, it’s all too easy for the computer operator to simply hit the default selection. It would not be (and was not, in fact, when it happened) a big problem in Portland, but could be disastrous at SN or one of the NACs with multiple age-levels of Veteran or Youth events. So Joe’s asked Dan for a configuration function, with which the computer lead could set all the formats in advance. Another FT change from XSeed, which required us to change our process, is the ability to include the strip assignments on all the sheets we print. So instead of printing out all the pool sheets and then writing the strip numbers by hand, we give the strip assignments to the computer operator before printing. The only trick with this is, in events with lots of pools of 6 and 7, to be sure to distribute the uneven pools among the available strips so that the 7s have the option of double-stripping on adjacent strips once the 6s are finished. So eventually—in better-than-average time—the pools went out, the pools came back, the DEs went out, the afternoon event started—and then we got to the really fun part of the day. We’d already had quite a few people come tell us how much more legible they thought the FT printouts were, but we hadn’t yet made public the next logical step. Joe had created a QR code and sent it to me a couple of weeks earlier, and my immediate reaction was that we should tell people about what was coming right then. Calmer heads prevailed, though, with the idea that we should make sure it all worked right before we went public. So I’d satisfied myself with making the signs to post as soon as we were ready, and once in Portland waited all through Friday morning for Joe to give the word. Once we were well into DEs and knew all the rounds were functioning the way they were supposed to, Joe gave the OK, and I grabbed the signs I’d copied the day before and posted them on the bulletin boards and around the BC table. Once the signs were posted, I sat and watched to see how people reacted to LIVE RESULTS! 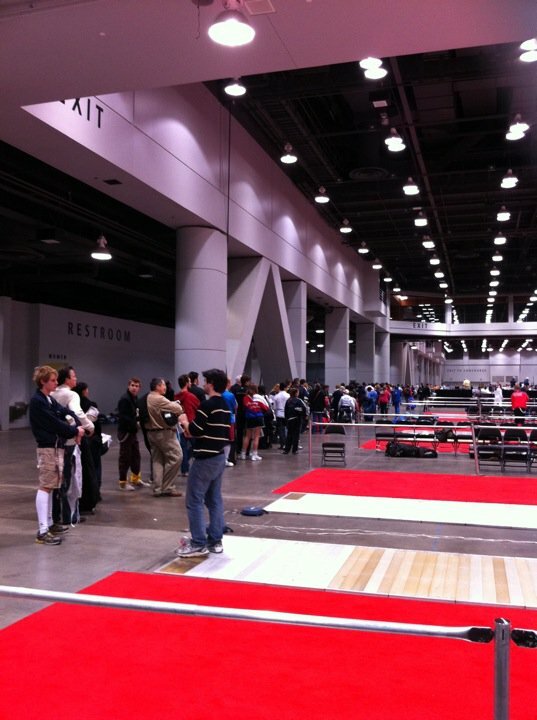 at a USA Fencing national tournament. The reaction didn’t take long. Tanya even received three or four approving emails within the first few minutes after we went public. We got positive responses all weekend, of course, and though it was difficult to tell because the venue was one of those rooms that never seemed crowded even when it was full, it looked as though a substantial percentage of fencers had realized they could find their strip assignments using their smartphones, so the bulletin boards never seemed quite as jammed as in the past. A few coaches and parents joked that it just wasn’t right that their at-home spouse knew how their kids placed before they did. There was that one guy, though, who looked at the sign on the bulletin board, took out his iPhone, and proceeded to take pictures of the posted sheets. But we took pity and showed him he could find much more information without using the camera at all. My flights into Cincinnati were completely uneventful and the scheduled shuttle (provided for officials by the local sports commission) was there to pick me up, so I checked in and dropped off my bag at the hotel and got over to the venue by 4:30 or so. The hotel is connected to the venue by a skybridge, so getting there in the morning will be easy—no need to worry about shuttles or light rail. The hall is long and narrow, so we just have one straight run of 4-pods this time, with the BC stage and the trainers roughly in the middle of the room. The armory is behind the BC stage, and there’s a long line, nearly to the end wall, of fencers waiting to have their gear checked. Unusually, all the strips are laid, but there are no scoring tables, so no towers or boxes or reels or cables set up yet. That means there’s not much for the armorers to do until the tables are here, so most of them are working gear check for now. Tanya is already here, of course (she came in yesterday), as are Joe and Marc, two-thirds of our three-person computer staff, and Carla, as ever, is working on the seeding for this weekend’s events. While I’m labeling my venue map and making copies, the scoring tables finally start showing up.They’re still not covered and skirted, though, so the armorers are still waiting to be able to set up the scoring machines, though they’re distributing reels and cords and towers around the room. At 6:00 pm, the entry doors are shut—the armorers will finish checking gear for those who are already in line, but that’ll be it for tonight, aside from the people who sneak in while others are leaving. At 7:oo pm, we shut the entry doors again. Since we can’t put up the strip numbers until the scoring machines are set up, I turn on my computer and work on the strip assignments for tomorrow morning. That doesn’t take long—with just two events, Div I Men’s Foil and Div II Women’s Epee, first thing in the morning, everything else will depend on when they finish their pools, so I’ll wait to do the later events until tomorrow. On what will be my F pod, the first of four video replay systems is being set up. Nobody’s quite sure how this will work: the idea is to use replay from the round of 8 for at least the Div I events, but there are only four sets. If we put one on the finals strip, that leaves only three for the F pod. But we’re not even sure yet whether there will be anyone to run the replay systems—the FOC was not informed of them in time to hire the extra bodies needed to use them, and nobody’s been trained on this equipment. Makes my little strip numbering experiment look pretty trivial. Kathy Brown, the head armorer, decides that they can’t wait for the table covers any longer but will go ahead and start setting up the machines. As it turns out, just as the armorers start, the venue crew appears with their supply of table cloths, so only one scoring table ends up without a cover. We ask them to leave the BC tables without covers, too—these tables have reasonably good plastic surfaces instead of the chipped and splintered wooden surfaces often found in convention centers, so we won’t have to deal with wrinkles and any spills will be easier to clean up. Oops, there’s one table with a curvature twice that allowed in sabres. Turns out it’s cracked, so we call for a replacement. Tanya and I ask Kathy if there’s anything we can do to help, since there’s not much we can do until the machines are set up, and she gives us a lesson in machine setup: unpacking the scoring boxes and power supplies and cords, attaching the boxes to the towers with cable ties, trimming the tie ends, attaching the floor cords to the boxes, stashing the machine boxes under the tables, etc. Tanya gets called away to handle something or other, so Gerrie Baumgart and I end up hanging a couple of pods’ worth of scoring machines on their towers. By then I’m out of cable ties (and I trust the armorers more to do things right, anyway), so I turn in my snips and return to more familiar chores. I leave copies of the map for the head referees, drop off copies for the armorers and the trainers, and start putting up strip numbers on the half of the room that now has finished towers. But before I finish, the rest of the gang announces they’re heading out for dinner, so I grab my computer and join them. We’ll come over early tomorrow and finish up. Since it’s after 9:00 pm, we go directly to the restaurant (a Rock Bottom Brewery, home to much BC comfort food—and drink). My immediate—and not unreasonable—goal for this tournament is to finish early enough to eat at least one more evening meal in a place where we get to sit and have food brought to us at our table. As we walk back to the hotel, we notice that The Colbert Report is on the downtown Jumbotron. Pretty cool, Cincinnati. To bed by 12:30, after ironing clothes for tomorrow, but I’m still awake when my roommate, whose flight was delayed, shows up at 2:00 am. Oh, well, that’s still only midnight my time, and I dozed a lot on the planes coming in. Alarm’s set for 5:30 am.